After being the targets of a whooole lot of Bloomberg spending (and a few Dreamsicles pestering them), the Savage City Council last night dealt a humiliating rebuke to Moms Want Action, Everytown, and Bence’s Biddies, refusing to even take up a proposed gun store ban within city limits. Thanks to the efforts of the Scott County GOP, local activists, and members of the Minnesota Gun Owners Caucus & PAC, the Savage City Council discussed – but made no motion to move forward – with a ordinance restricting gun stores in the City. This is a HUGE VICTORY for gun owners across the state. I love the smell of burning stacks of Bloomberg cash in the morning. It smells like victory . 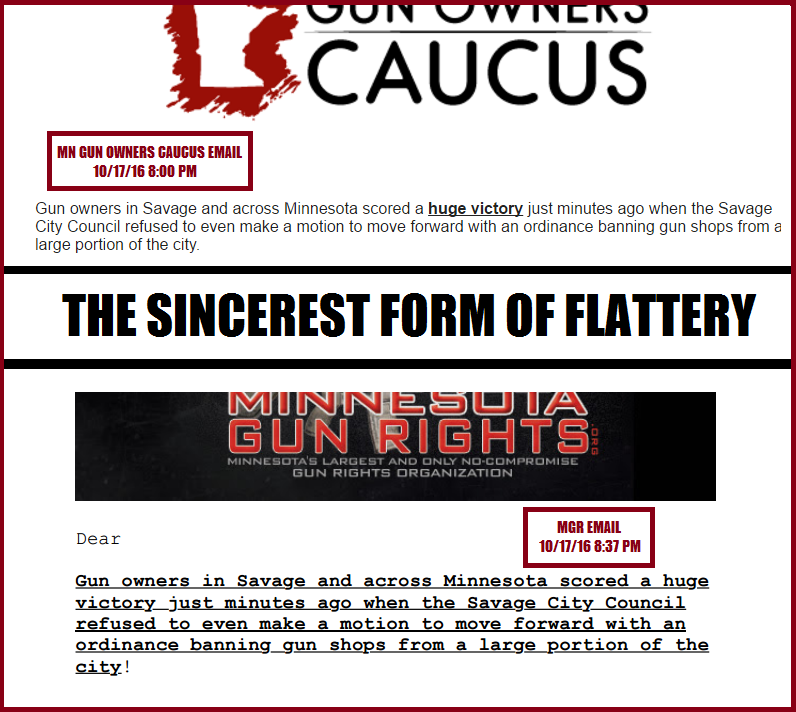 Oh, yeah – I’ve written about Minnesota Gun Rights in the past. It’s the Iowa-based group that raises lots of money, doesn’t do much actual work in Minnesota, and claims credit for others’ work. This entry was posted in Grass Roots by Mitch Berg. Bookmark the permalink. Perhaps the left wouldn’t have a reputation as being anti-business if they did not spend so much time trying to shut down businesses and kill entire industries. You’re on the losing side of an arc of history. You may have won short term; long term you will lose. The left is not anti-business and never has been Bento; that is a right wing myth. The stats clearly show that business and economic growth is higher under Dems. That’s because trickle down / supply side economics do not work; rather it is one more way the right redistributes wealth to the already extremely wealthy. It’s too far back to go looking for it, but why was it the North Carolina GOP office that was firebombed claimed through their official spokesperson that they had completed absentee ballots? That was of course illegal………and the GOP did retract their statement. But if they never had any completed absentee ballots, which are illegal because of voter fraud / ‘absentee ballot harvesting’………why would they say it in the first place? It’s sort of like saying “and no murder weapons were burned in my garage fire” and then later saying “but that’s because I never had any murder weapons” ONLY after someone mentions murder weapons are illegal. Again – check the news. You have not the faintest idea what that statement was about. Given your history, my vote is with the last three. Off topic here, but in response to your earlier post — I assume you were unwilling or incapable of fact checking this so I provided the link for you. You no longer have the right to go off-topic on my blog. And you are not a fact-checker. You are a congruency monitor for left-wing chanting points. Nothing more. You’re on the losing side of an arc of history. You may have won short term; long term you will lose. FACTCHECK: You can not predict the future. Hell, your knowledge of the present and past is so dubious, most of us assume everything you say is wrong until proven otherwise. FACTCHECK: Savage is a hard red town in a reddish-purple district. And gun rights people are on a 20-year-long roll. We keep winning, and your pro-fascists keep losing. i>The left is not anti-business and never has been Bento; that is a right wing myth. See above re assuming what you say is wrong. More in the next response. The stats clearly show that business and economic growth is higher under Dems. Only “stats” that are tortured completely out of context. So please provide a cite supporting this claim of yours. Then, those of us who actually deal with data in real life will explain to you why you’re wrong, as usual. This is not an optional request. You will respond, or your comments will ghost away into the night and fog. Depending on the nature of your response, further response may be required. You are going to see the collapse of your “case”, or you will lose your only outlet with any readership. Your choice. I care not which you choose. DG, if the left is not anti-business, please explain why the collective cost of Obama era regulations is nudging up towards a trillion bucks a year. Tell me why the left reflexively supports unions that (like the USW and UAW) have put hundreds of thousands of their own members out of work, and ignores crimes committed by union organizers. The only way the left is not “anti-business” is if you have to have massed bombers destroying factories to qualify, and even then, Detroiters might be forgiven for not seeing the difference between Democrats and the Luftwaffe. Argument from history is not distinguishable from argument from power. It was not the ‘arc of history’ that did in the Confederacy, it was Union troops. The belief that history has a purpose and you can be on its right or wrong side is a statement about morality, not a statement about history. When the thugs, goons and thieves are done ransacking your house and you realize a weapon might have prevented losing everything, we’ll accept your apologies without smirking. Well, we’ll try not to smirk. Do what you think is right, history will take care of itself. Can’t wait until the debate next Tuesday. Of course, if the anti gun faction shows up. I half expect either one or both of them to cancel. The problem with DG is not that she is not a ‘deep thinker.’ There are plenty of good people, credits to the human race, who are not ‘deep thinkers.’ DG’s problem is that she is convinced that she has reasoned her way to her political views, when she has hated and snobbed her way to them. History is what people did, when they did it, and why they did it. If you leave the ‘why’ part, you might just as well record random events. If you believe that history is a thing that happens to people, instead of something they create, the only answer to ‘why’ is ‘because they had to’, and you might as well stop wasting your time with history and build model airplanes, or go golfing. Is Merg about to take “dog gone” as a suggestion worth following? Here you go Mitch. I’d love to see you or any of your Mitchketeers see this as contorted. The analysis considered a 64-year period beginning with President Harry Truman and ending with President Barack Obama. In all, that takes in the complete presidencies of seven complete Democratic terms and nine Republican terms. The success of the Democratic states seems to play out across the board, even beyond the economic realm, as is evidenced by the consistently stronger performance of the Democratic states in terms of standard of living. In fact, even lifespans differ dramatically between red and blue states. It seems clear that liberal policies are performing better at the state level across the board. I posted some ideas about why Democratic states are doing so much better economically earlier, but for our purposes here all that matters is that they are in fact doing so much better. And from something I wrote recently about the 370 economists (including 8 nobel laureates) who wrote the open letter to the WSJ, and the second letter the next day by 19 nobel laureate economists, who wrote the open letter about what a disaster Trump economic policies are. Those are classic conservative policies which were significantly created by Arthur Laffer, of supply side economic policies and the Kansas economy and tax plan disaster. They cut taxes to the rich, screw the middle and lower economic classes and result in lower growth rates which if we are lucky would barely register at the level of increasing population — in other words, not real growth. Those would be the same crap the conservatives consistently push which never ever ever work. Since it took effect in January 2013, total employment in Kansas has risen only 2.6 percent, compared to 6.5 percent nationally. Private sector employment in Kansas has risen 3.5 percent, compared to 7.6 percent nationally. The state’s economy has grown less than half as fast as the national economy; Kansas’ gross domestic product (GDP) grew 4.8 percent from the end of 2012 through the first quarter of 2016, while national GDP rose 11.9 percent. Kansas’ share of newly opened business establishments in the United States has actually declined slightly rather than increased. Personal income tax revenues in the fiscal year ending June 30, 2016 (fiscal year 2016) were almost $700 million lower than those received in fiscal year 2013, when the tax cut first took effect, even though the economy nationally is stronger in 2016 than it was in 2013. Receipts dropped immediately by slightly more than $700 million (24 percent), and the meager economic growth that occurred in Kansas from 2014 to 2016 boosted collections by only $30 million, or less than 2 percent. Total General Fund revenues in 2016 were $570 million below 2013 levels, despite significant sales and cigarette tax increases enacted to partially offset the income tax losses. The General Fund’s ending balance fell from $709 million in 2013 to $40 million in 2016 (just 0.7 percent of General Fund spending). That’s important because Kansas’ General Fund balance is its “rainy day fund.” Should a recession hit and tax revenues shrink as household incomes and retail sales fall, the state will need to cut programs or enact tax increases almost immediately because it will have very little savings to tap. The General Fund’s depletion occurred even though the state transferred to the Fund substantial tax revenues that were collected to finance road maintenance and construction. The resulting reduction in infrastructure funding has forced the state to postpone numerous highway projects indefinitely. Because the tax cuts leave less state revenue with which to repay people who lend the state money by buying its bonds, Kansas’ bond rating has been downgraded twice — in 2014, and most recently on July 26, 2016. Lower bond ratings mean that the state will likely have to pay a higher interest rate on future borrowings, raising the cost of infrastructure projects such as school construction and road building. Nationally, total nonfarm employment since January 2013 has grown by 5.9 percent – far outpacing Kansas’ 3.3 percent growth rate. Looking at just private-sector jobs, the U.S. growth rate has been 6.9 percent – way above the 4.3 percent of the Sunflower State. To add insult to injury for Laffer and Moore, who constantly whine about states with steep income taxes, high-tax California and New York have added employment much faster than Kansas. You could add Minnesota in contrast to Wisconsin and get a similar picture – we are doing better with higher taxes but better government spending for things like infrastructure – roads and bridges, internet, energy grid upgrades – than WI. Those things create a pro-business, pro-job creation economic environment. Tax cuts do not. Well into the 1950s, the top marginal tax rate was above 90%. Today it’s 35%. But both real GDP and real per capita GDP were growing more than twice as fast in the 1950s as in the 2000s. At the same time, the average tax rate paid by the top tenth of a percent fell from about 50% to 25% in the last 60 years, while their share of income increased from 4.2% in 1945 to 12.3% before the recession. In short, the study found that top tax rates don’t appear to determine the size of the economic pie but they can affect how the pie is sliced, especially for the richest households. Need more? Right wing economic policies are redistributive to the wealthy, but they do not grow the economy or lead to job creation. See the results of the Bush tax cuts for additional evidence. In contrast Keynsian economics are far more successful. And then we have comparisons with low tax states like Kansas, and high tax states like California. Of course, the study you cite didn’t control for other events; it merely correlated economic indicators with administrations. So Truman got the post-war recovery, LBJ got the sixties expansion (which was due in part to JFK’s tax cuts, which is nothing any Democrat today would do) not to mention benefitting from the fact we were the world’s only functional economy, even as late as the mid-sixties. Clinton got the “Peace Dividend” – and had his biggest-spending impulses neutered by the GOP after 1994, when he essentially turned into a lame duck. I’ll leave the rest for later. Hopefully others will bite a chunk out of it. You will need to respond to the responses. Then I’ll think about un-moderating you. OK, we take 64 years going back to 1950 or so, in which case we are mixing the results of relatively liberal Republicans in with Reagan, and in which we are also ignoring the fact that until 1994, Congress was controlled by the Democrats, and in which we are also ignoring the time bombs Carter and Clinton (and now Obama) have left for their successors. And we’re assuming that Presidents always get their way, which is why the recent economic downturn started in 2007, when the Democrats took Congress from President Bush. DG, I’m sorry, but this is a classic example of a monovariant analysis of a clearly multivariant system with no controls for other variables. Plus, regarding your comment itself, “brevity is the soul of wit.” Hint, hint. TL;dr: Republican presidents get to clean up the mess made by, and fix the crap broken by Democrat presidents. Democrat presidents get to enjoy the good times brought about by Republican presidents’ policies, while enacting the policies that bring it all back down again. Per Bill’s comment, it’s worth noting that since Presidents make decisions that affect the future, a look at economics during their tenure will really tend to miss the effects of their decisions. Plus, another variable; the Federal Reserve and the business cycle. So what we’ve got is a kindergarten level letter to mommy posing as serious political commentary, really. A truly significant contributor to the economic health of this country was firmly anchored in the Federal Aid Highway Act of 1956 supported by The Highway Revenue Act of 1956. First by infusing local/state economies with federal monies and jobs for the subsequent 34 years and second, as routes were completed, cities and industries along those routes experienced growth and development that redefined their status regionally and nationally as interstate commerce(trucking primarily) brought goods, services and opportunities. Had they routed I-35 through Rochester and Stillwater and I-94 north through Duluth the twin-cities would look like St Cloud or Mankato. A great deal of the domestic economic growth of the past 50 years that subsequent Presidents benefited from is directly attributable to the policies and laws of President Eisenhower’s administration.